hArduino-1.1: Control your Arduino board from Haskell. NB. As of March 2 2013; StandardFirmata that's distributed with the Arduino-App does not support the high accuracy pulse-in command, which is needed for this sketch. However, there is a patch to add this command; see: http://github.com/rwldrn/johnny-five/issues/18 for details on how to install it. You should have this patched version of Firmata running on your board for this sketch to function properly. Accuracy: Keep in mind that measurements on a platform like Arduino is always subject to various errors. Relying on this program for precise distance measurements would be a mistake. The results here should be accurate to within about half-a-centimeter, provided you stay within the range of HC-SR04, which is between 2 to 400 cm. For anything more precise than this, you'll need to use a much more sensitive sensor. Measure and display the distance continuously, as reported by an HC-SR04 sensor. Wiring: Simply connect VCC and GND of HC-SR04 to Arduino as usual. 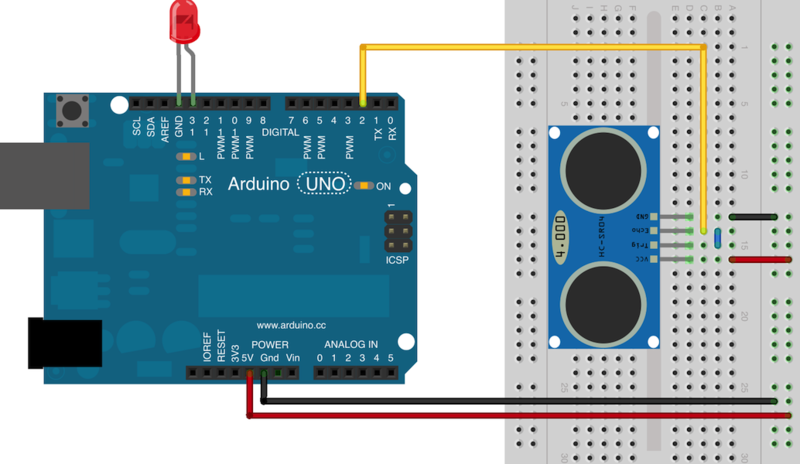 The Echo line on the sensor is connected to Arduino pin 2. The Trig line is connected on the board to the Echo line, i.e., they both connect to the same pin on the Arduino. We also have a led on pin 13 that we will light-up if the distance detected is less than 5 centimeters, indicating an impending crash!